Nothing says summer in Wisconsin like fresh picked strawberries. 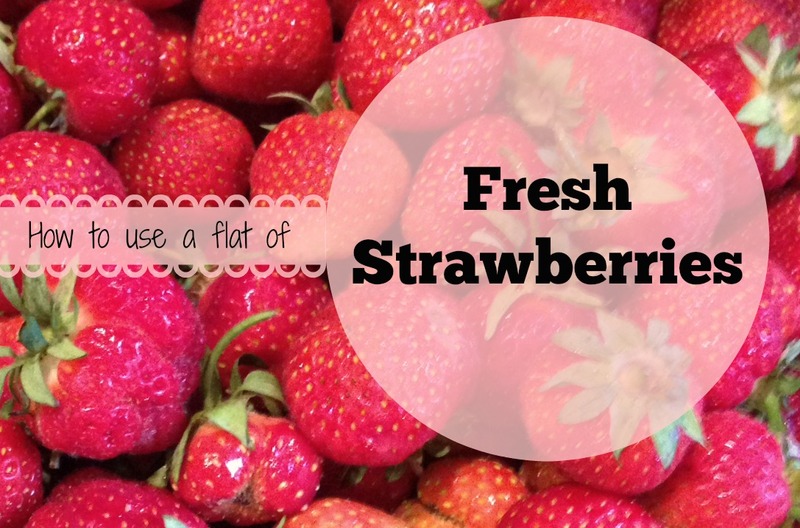 Whether you have your own personal patch or you pick up strawberries from a local berry farm, the sweet deliciousness of a Wisconsin strawberry can not be beat! But, here in Wisconsin, the strawberry season is SO short. Here’s a run down of what I do with my strawberries to try to lock-in the amazing flavor all year long. I like to buy a “flat” of strawberries at a time. Depending on how much extra time I have during the season, I may buy multiple flats, but I ALWAYS have to get at least one. If you are unable to do something with your strawberries right away, make sure to not wash them and refrigerate them right away to prolong their peak flavor. 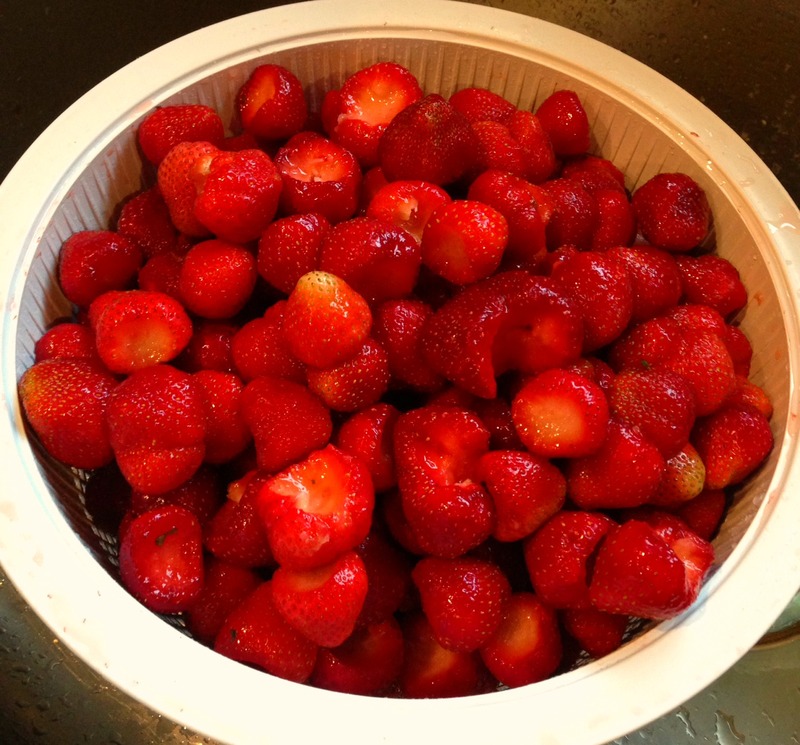 Each flat of strawberries I buy gets divided into berries to eat right away and berries to preserve. I go through the whole flat, removing the stems and then dividing them into 2 colanders – 1 for “perfect” berries and one for any berries that are over-ripe, under-ripe, or funny shaped. I want non-perfect bowl to contain many more berries than the perfect bowl as those will get made into jam and frozen topping for us to enjoy all year long. The perfect bowl never lasts long and it is the one that the kids get to eat right out of and gets served along with dinner that evening and made into Strawberry Shortcake (click for recipe). My 2 must-have strawberry prep tools if you are working with large quantities of strawberries are a stem corer and egg slicer. The stem corer makes it a cinch to get the tops off of the berries and the egg slicer gives me nice, even slices that help the topping freeze extremely well and look pretty too. Strawberry Freezer Jam is one of my husbands all-time favorites. I use Pomona’s Universal Pectin because I like that it is able to be used with low-sugar recipes and recipes with white sugar alternatives, like honey. After making a few batches of freezer jam, I freeze the rest of the strawberries in my flat as sliced strawberry topping. After slicing about 4 cups of strawberries, I add 1/4 cup of sugar and let it sit on the counter for about 30 minutes. The strawberries should now be nice an juicy. I just dump it into a gallon freezer bag, label it, and lay it flat in our freezer. Simple! What are your favorite ways to use or preserve fresh strawberries? Super Easy! My boyfriend loved it! Will definitely make again and again! Thank you!